Dockmaster building rises at Steelpointe Harbor. 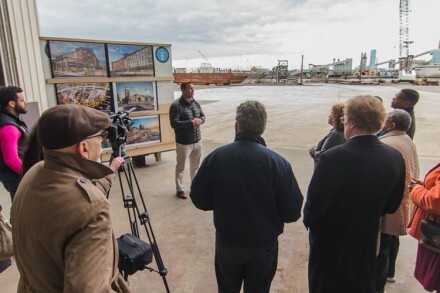 The developers of Steelpointe Harbor that’s transforming the face of the East Side a short distance from Downtown recently provided city officials an on-site update of the Dockmaster Building under construction along the waterfront. 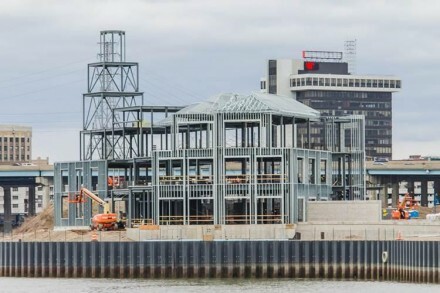 The Dockmaster Building, expected to be completed this year, will be 48,000 square feet featuring the office of the marina on the first floor along with a raw-bar restaurant opening onto the Harborwalk, says Robert Christoph Jr., a principal with Bridgeport Landing Development. The restaurant and 200-slip marina will open spring 2019. Boat shows and fishing tournaments will come alive along the waterfront. 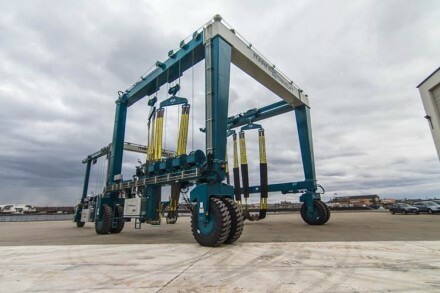 Two new travel lifts on the site called Bridgeport Shipyard are capable of lifting most ships that ply Long Island Sound out of the water for storage, upgrades and inspections. The Bridgeport Shipyard will be up and running June 1st and will house and maintain both commercial and recreational vessels. The first phase of the residential building, located behind the Dockmaster Building in the corridor bordered by Stratford Avenue, Pembroke and East Main Streets, is schedule to break ground later this year with an 18-month construction schedule. The residential building is being designed with underground parking, retail at ground level and approximately 200 residential units above it. “The residential building will help tie the previously built Bass Pro Shop, Starbuck’s, Chipotle, and T-Mobile retail locations north of Stratford Avenue to the waterfront,” says Christoph. Robert Christoph Jr. addresses city officials. As previously noted in an OIB story the economics of the development are now being realized. 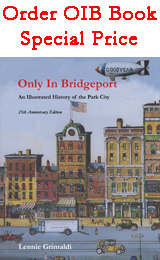 – Bridgeport Landing Development has spent more than $5 million on city property acquisitions. – Property tax payments for current budget year $1.3 million. The number will grow with construction of the Dockmaster Building and upcoming residential component, with an additional 300 construction jobs. Under the financing approved for the district, the city keeps the first $400,000 of real estate property taxes annually and all personal property taxes. The remaining tax receipts are given back to the district toward infrastructure costs. – Building permit fees paid to city to date more than $500,000. – Personal property taxes combined from Bass Pro, Starbucks, T-Mobile and Chipotle’s, $65,000 for this budget year. – Construction costs for current tenants, Bass Pro, Starbucks, T-Mobile and Chipotle’s, $48 million that included 400 construction jobs for nearly two years. 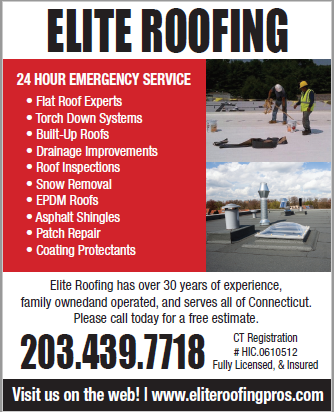 – More than 250 permanent jobs, with more than half Bridgeport residents. – More than $50 million combined investment of federal, state, local and private dollars for infrastructure improvements including street reconstruction, utilities, separate sanitary and storm sewers, environmental and construction of the bulkhead and harbor walk. More than half is private dollars invested by the Christophs’ company Bridgeport Landing Development. – The site covers in total 52 acres including 44 buildable. The entire site is now controlled by the developers. – The developers increased the height of the bulkhead, with six feet of clean fill, following Federal Emergency Management Agency regulations in the aftermath of Hurricane Sandy. The entire shoreline area is now above the flood plain. It dwarfs 10 Middle St.
“It’s all a matter of point of view.” Stephen A.
Mr. Walsh, My name is Steven, Steve, Estaban, Steve, Steverino… Never Stephen with a PH. Thanks. I want to see 60 story high-rises in Bridgeport but people like yourself that live in Branford like to see Bridgeport development happen at a snails pace. Helps you rationalize your departure to an area that is 94.05 percent white 1.35 percent African American. We do moiss you in Bridgeport but you have no voice here anymore and Bob Keeley your man is done so we know at least he will not hold up any development. Gage Frank- Make no mistake about it. The success of the Bridgeport school system is key to the successful future of all of Bridgeport’s economic development. Throwing money without a plan is not going to work. Asking for millions every year for decades without specifics is just a waste. If you spent time in any of the schools in the city. You would see such waste!!! Personal property taxes from Bass Pro, Starbucks, T-Mobile and Chipotle’s, $65,000 for this budget year. Is that the total tax revenue for all four businesses or for each business? Bass Pro personal property has been assessed at $814,393 and Starbucks Coffee $132,341. The mil rate is likely to increase July 1, but based on the current rate Bass Pro would pay $34,365 in personal property taxes, Starbucks Coffee would pay $5,584. Bass Pro and Starbucks pay the same in Taxes, as three Cape Cods houses on Seaside Ave.
Baloney, Sonny. You’re comparing personal property taxes with real estate taxes. Bass Pro and Starbucks are tenants to the property owner. They pay personal property taxes, not real estate taxes. The Cape Cods are not paying personal property taxes in Black Rock, they are paying real estate taxes, unless they have a home-office business which would require them to pay additional personal property taxes. They pay for those Moose heads , Foxes, Ducks, and coffee machines less then one cape cod in Redding. 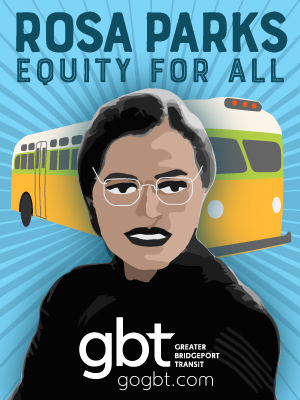 Just what the city needs, more tax abatements. That really helps the people of the city of Bridgeport. Sounds like their getting a break on the personal property taxes however who pays the real estate taxes on all the sites with or without actual property on them? Also, steel-point is just down the street from the “Baby Bronx” area; whats the plans for that area if any??? Majestic/Palace, etc. along with the Webster Arena, new entertainment center where the Blue Fish played, comedy play-house, Bijou, Cabaret, Klein, etc.. Takes lots of people, money, acts, traffic control, police presence, parking, all equals major city tax increases for Bpt. residents! Glad to see progress down there! So what is the next restaurant tenant, Arthur Treacher’s Fish & Chips? That is correct, I would have preferred my favorite Seafood place that would have been a perfect fit. “Westfair Fish Market. The best whole Belly Clams and every chowder. Russ is the owner. Nice Guy and a Republican. Best food and I do know that Bridgeport approached him a few years ago. It would be wise to approach again. Perfect for a waterfront. Just my thoughts as I am on a meeting break and had to add my 2 cents. Located in Westport on the Post Rd. Across the street from Stop and Shop. Does anyone know if there is going to be a bait and tackle shop there and will gas be sold on the dock? Gas at a dock is always higher at a dock than a gas station. I agree with Steve a high end fish market would be a great fit here. A restaurant similar to Captain’s Galley or Jimmy’s of Savin Rock would be a good fit too. Bridgeport needs a high end fish house, actually. Given the city’s maritime history it is a damned shame we din’t have one. It would be nice if the menu reflected the “melting pot” food culture of the Park City.